We missed the April showers, but we got a few in May, and now we have the flowers to prove it. Tree peonies don’t die back in the fall like herbaceous peonies. I just love this tree peony, which is in its third season in my yard. It may be located in a spot that is just a bit too shady, but the blooms are a lovely part of late spring-early summer. I believe this one is Paeonia ‘Kokuryunishiki’. I made the identification from a photo from the Scott Arboretum at Swarthmore College that looks very similar to the one I have. 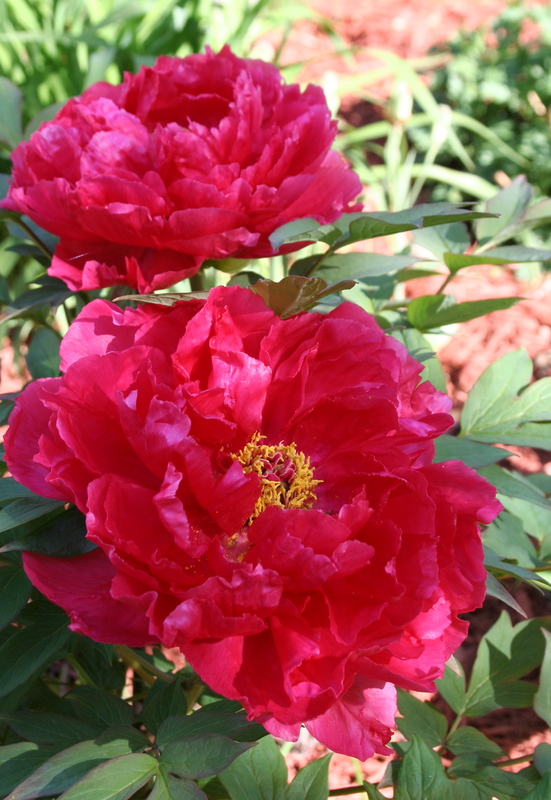 Unlike herbaceous peonies, which die to the ground each fall, tree peonies are more like a shrub. They are slow growing, but eventually reach 4 to 5 feet in height with dozens of blooms. 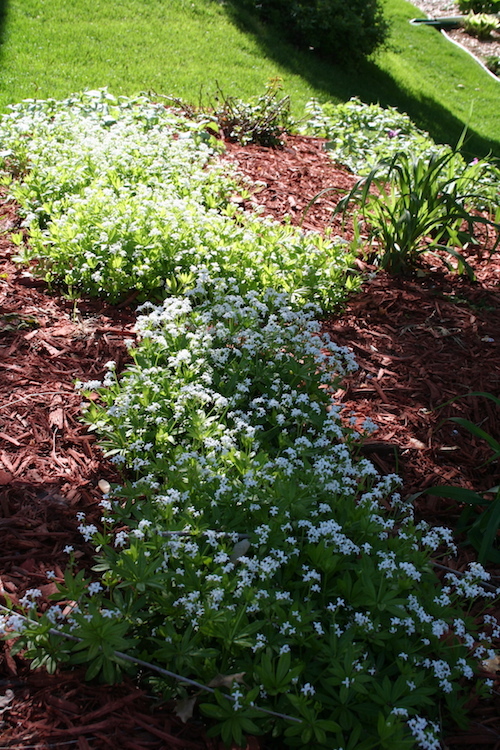 Sweet woodruff is a well-behaved groudcover that grows in partial shade. Another bloomer now is sweet woodruff, a groundcover I planted after reading an article about it by Terry Yockey. What a sweet plant! The foliage is bright green and the flowers really lighten up a shady spot. It is a bit of a spreader, but I planted it under a tree in hopes of getting a big swath of it over time. 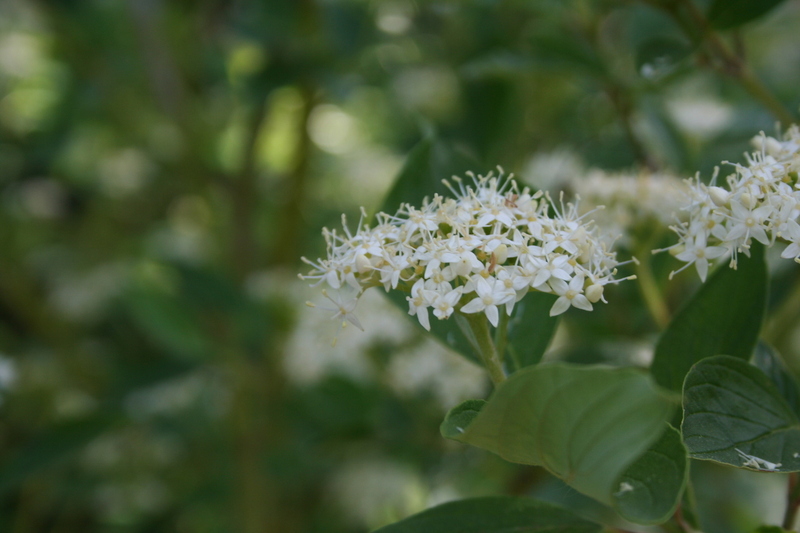 Flowering shrubs are also in bloom now, including lilacs and one of my favorite shrubs, red-twig dogwood. This plant looks good all year long–from its bright red branches contrasting with winter snows to these dainty white flowers. My only beef about dogwood is you do have to prune out some branches almost every year to keep it looking nice. What’s blooming in your May garden? Red-twig dogwood is known for its bright stems in winter, but the spring flowers are pretty, too. So much is blooming-almost everything, it seems! I’ve been especially pleased with shade plants-those that enliven the north side of the house. They include: virginia bluebell, solomon’s seal, a yellow primrose, tiarella, brunnera, jack-in-the pulpit, lamiums, and the delicate foliage of ‘Lady in Red’ fern. Elsewhere, some of the early peonies are in late bloom; iris, lupine, allium, cranesbills, and others are enjoying their April tropical start to life this year! Great time out there! I’ve got trollius, iris, centaurea, creeping phlox, spring anemone, wild geranium, azalea, lilacs, linum, poppies, salvia, edelweiss, dianthus, dicentra, one rose (morden blush) and a few lingering tulips. I’ve had a tree peony for about 7 years. After some winters I lose about a foot of growth on the top due to winter injury, so it hasn’t gotten as big as I expected it to. Right now it is about three feet high, but has been about 4 feet high at times. Maybe Minnesota is a bit chilly for tree peonies.